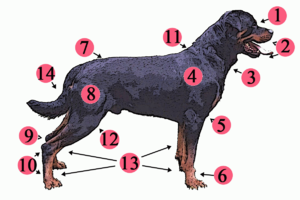 The Rottweiler is one of the oldest of herding breeds. With a history possibly dating back to the Roman Empire, the Rottweiler may be a descendant of ancient Roman drover dogs; a mastiff-type dog that was a dependable, rugged dog with great intelligence and guarding instincts. During their quest to conquer Europe, the Roman legion traveled in large numbers across the continent. The non-existence of refrigeration meant the soldiers had to bring herds of cattle with them on their excursions for food. These drover dogs were not only used to keep the herds of cattle together, but to guard the supply stock at night. Around A.D. 74 the Roman army travelled across the Alps and into what is now southern Germany. For the next two centuries the Roman drover dogs were continually used in herding and driving cattle for trade even after the Romans were driven out of the area by the Swabians.